Aba Festival excites visitors as Obaseki harps on unity in diversity ON AUGUST 26, 20176:42 AMIN NEWSCOMMENTS Igarra, the administrative headquarters of Akoko-Edo Local Government Area of Edo State was the destination on Friday for lovers of culture in the state and beyond as sons and daughters of Igarra, rolled out the drums to celebrate the 228-year-old colourful Aba Festival that was graced by the Governor of Edo State, Mr. Godwin Obaseki, Legislators and other senior government officials. Deputy Governor of Edo State, Rt. Hon. Philip Shaibu, who represented Governor Godwin Obaseki, speaking at the Aba Festival on Friday. He is flanked by the Speaker of the House of Assembly, Hon Kabiru Adjoto (left) and the Chief of Staff to the Governor, Mr Taiwo Akerele (right). Declaring the festival open, Obaseki who was represented by his Deputy, Rt. Hon. 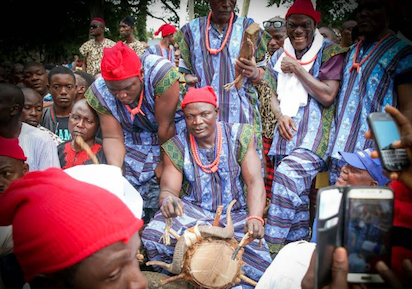 Philip Shaibu, said his administration would take advantage of the appeal of cultural events such as Aba to strengthen the existing unity among Igarra people and Edo people in general. He further said that the festival would receive more attention from his administration so that it can boost the economy of the state. “This is a beautiful culture that needs to be celebrated by the people of lgarra as well as all Edo people and should be a rallying point for all of us so that we can collectively woo more tourists to come and invest in the state and enjoy our rich cultural heritage,” Obaseki said. In his remarks, the Chief of Staff to the Edo State Governor, Mr. Taiwo Akerele, said the event was significant to the people of lgarra especially those graduating from one age group to another. He explained that the festival was a unifying event for the people of lgarra, adding that the grand finale is the beating of the Aba drum. Beyond the dais where the dignitaries, traditional rulers, community leaders and elders sat, were youths, women, children in colourful costumes, who put a spark to the 38th edition of the festival that featured rhythmic dance steps, singing, merry making, inter-change of goodwill, expression of pride by those transiting from one age group to another and the sound of the Aba drums.